This is Tim's first published work that isn't a novel in the thriller/mystery genre. A year or so ago I came up with my very own six-word story, which forms the title of this book, the reason this collection now exists. I’ll leave the exact story of how the phrase came about for maybe another occasion––it’s loosely fitted into my second story, anyway––and just let the words speak for themselves. I hope you enjoy this––the first volume––something which I assume will grow over the years, as others contribute their own take on the phrase. I can’t wait to see what these might all be. Just finished this lovely offering and really pleased and excited by it! I love the way that the author kept me guessing and although it was short it more than did the job. Short stories have never really been my cup of tea but I am making an exception now and look forward to more from Tim. Well done and get some more out here please!!!!! Enjoyable as they were, I wanted to know more about the first story. It didn't seem finished as I wanted to know why he was in prison, did he get the brother? The second story was better in my opinion, I got the message it conveyed. Look forward to volume two. 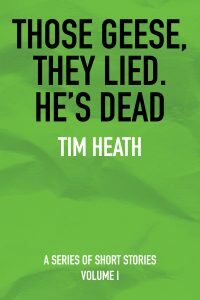 A different approach from Tim Heath with this, the first of his volumes of short stories. Easy reading and worth a try, although I have to say I prefer his mainstream work. I enjoyed the short stories and Tim's style of writing. I will certainly read more by this author. Thanks Tim. Really enjoyed reading these short stories. Kept me gripped. Wished there had been more in the book. Didn't want to finish it. Can't wait for next book. Well done Tim. Very intriguing book and I thoroughly enjoyed it.